Tracey P. Lauriault, is Assistant Professor in Critical Media and Big Data, Communication and Media Studies, School of Journalism and Communication, Carleton University and Cross Appointed to the MA in Digital Humanities. Her work on open and big data and open smart cities, is international, transdisciplinary and multi-sectoral. 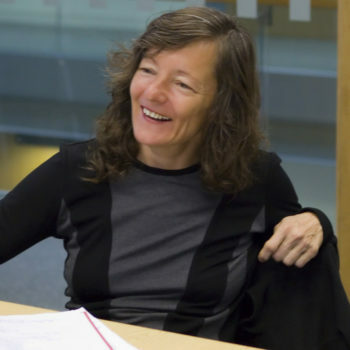 She is one of the founders of the new domain of critical data studies and of open data in Canada and has expertise in data infrastructures, spatial media and smart cities. Data and related data technologies are core infrastructure for cities and are more that IT and operations, and I would argue that smart city technologies should be part of urban plans and be discussed with residents. These large technological systems no only manage and monitor infrastructure, they are infrastructure that involve, data, code, algorithms, apps, sensors, and platforms that will manage traffic, utilities, equipment and bridges, but also, they are technologies that observe, survey and nudge social behaviour. It might therefore be time for social and technological impact assessments – social, environment, economic, and public good. We will need to apply systems thinking across all business units, from social services to transit, and integrated across digital strategies, open government and data, and procurement. The ideals of open smart cities are moving us in that direction, and it might be better to start that opening consultative processes now before we get locked into large technological solutions that may not be in the public interest.